I think without any doubt Heidi Swain is becoming one of my favourite authors up there with Trisha Ashley and Katie Fforde. The dizzy heights of being able to pick up a novel by this author and know that you are going to get a good story from the very beginning. Lottie inherits a cottage in the village of Wynbridge, not any old cottage but Cuckoo Cottage which was previously owned by Gwen. Trouble is a number of the villagers think that Lottie is the cuckoo in the nest as she had only a tenuous link to Gwen. Lottie though has other ideas, she has to live in the cottage for a year and as she has no other commitments or roots put down and no other family why should she not take up residence? The cottage holds a very dear par of her heart and perhaps here she can find what it is she wants out of life. The cottage has some secrets and local builder Matt befriends Lottie and helps her with some of the more challenging tasks, trouble is local neighbour Will seems to think it is only a new shower and safer fuse box will keep the cottage going for many years to come. When Lottie agrees to renovate a caravan for The Cherry Tree Cafe, but to keep it secret until she knows that it will work, it sparks some intrigue from the other villagers. What is Lottie going to do? Of course without knowing the truth people speculate and make their own minds up. Lottie is lost on who she can trust now and it seems that the only way to know for sure is to tell the truth. But there are some other locals who might need to start telling the truth too. What will the truth lead to? If you have read other Heidi Swain novels you will recognise some of the characters. But not knowing who they are is fine, this can be read as a standalone novel and out of publication order as I have done. I wanted to keep reading about Lottie, her cottage, her plans and the way the community embraced her, well nearly all of the community. Her cottage sounded just the sort of place to visit, for a cup of tea, a large piece of cake and an afternoon in a lovely squishy chair by the fire reading a book – in fact a book just like the one I have described. An excellent book to escape right into, you will not be disappointed. Thank you to the publisher and netgalley for the opportunity to read this novel. 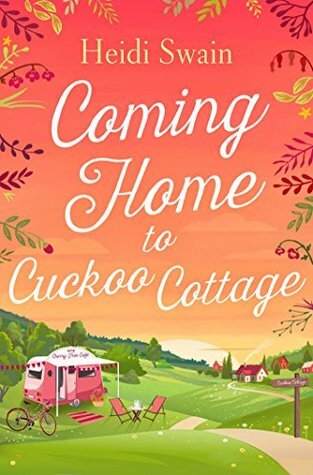 Coming Home to Cuckoo Cottage is out now.